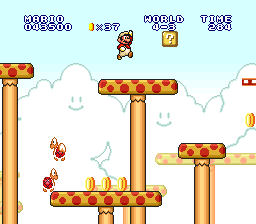 World 4-3 is the third level of World 4 in Super Mario Bros. Unlike most ground levels, which have a green or gray palette for objects, this level has an orange and red one for the tall Super Mushrooms, which also affects the flagpole. This level takes place on tall Super Mushrooms, some of which are lined with coins and/or Koopa Troopas and are separated by scale lifts or Koopa Paratroopas. Over the third tallest Super Mushroom is a ? Block containing a power-up. After the first scale are two vertically moving lifts, and afterward are a group of three scales before a final lift that can be used to reach the top of the flagpole. This page was last edited on April 22, 2019, at 18:25.